Wide Asleep in America: State of the Union 2008 Wrap-Up Wait, What Year is This? No, I didn't watch it. But I have read a bit about what was said, and made the unfortunate decision to actually visit the White House website to take a gander at the transcript. At least I can read the word "nuclear" correctly. Needless to say, nothing surprised me. 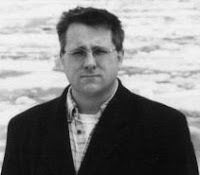 I think this piece, entitled The Sorry State of a Lame-Duck's Legacy, by The Nation's John Nichols provides a pretty solid post-mortem, but it does leave certain things out. Things that I find rather important. At least we can be sure that Bush's (speech-writer's) idea of the Palestinian people 'living in dignity and at peace' doesn't necessarily have to include a working sewer system, the importing of medical supplies, or right to not be killed by the Israeli military. All Bush wants are some purple thumbs and half-price hummus, is that too much to ask? Apparently. And tonight I have a message for the brave and oppressed people of Iraq: Your enemy is not surrounding your country - your enemy is ruling your country. And the day he and his regime are removed from power will be the day of your liberation. Hey, if only the Iraqis could remember that America is their friend and that they have been free ever since Saddam was deposed, maybe they'd smile a bit more before getting tortured and murdered by our beloved troops. Here's an excellent, if not troubling, piece on the ridiculous speech Bush gave last night. William Rivers Pitt is a teacher, political commentator, a New York Times and internationally bestselling author of two books, and was formerly the Press Secretary for Dennis Kucinich during the 2004 presidential campaign. George W. Bush's State of the Union (SOTU) speeches have been the basis for a new kind of drinking game for several years now, basically because the things have always needed some kind of actual substance from somewhere, and because it was a good way to dull the pain of it all. The rules: 1. When he says the word "terra" or "terra-ists," take a drink. 2. When he says "tax cuts," take a drink. 3. When he says "Iraq," take a drink. 4. When he says "nook-yuh-lerr," take a drink and a shot and a good swift kick to the head. Et cetera. But that's just one night out of the year. Reality has proven to be far more alcoholic in nature. For seven years now, the whole phenomenon of this government has been one long drinking game played out each and every day. The rules of this game? 1. Say the words, "George W. Bush is in charge of the country." 2. Turn off the TV. 3. Just drink. Sounds familiar, right? Just about everyone has played that game a time or two by now. We have endured seven Bush SOTU speeches as of last night. Seven years worth of lies, carnage, greed, disgrace, failure, ignominy, calamity heaped upon calamity heaped upon calamity for more than two thousand five hundred days now, with three hundred and fifty seven more days still to go. The final deal went down in DC last night, wreathed in all the pomp and circumstance of political theater and media spectacle. The first tangible evidence this long national and planetary nightmare is actually beginning to come to an end was served up live on network television, for the viewing pleasure of a thoroughly disgusted and entirely disinterested American public. If Bush's lips are moving, it means he must be lying; so it has been for all those days, and so it was again on Monday evening. Some 75 percent of the citizenry believe this country to be "on the wrong track," and since the gomer giving the speech last night is seen as being largely responsible for putting us all on this "wrong track" to begin with, a vast American majority pretty much didn't give a fig about what he had to say. All that most people cared about was the historic significance of the night itself. It was The Last Bush SOTU Speech Ever. Remember Bush's SOTU speech from January 20 of 2003? That was the one when he told America Iraq was in possession of 6,000 liters of anthrax, 38,000 liters of botulinum toxin, 500 tons of sarin, mustard and VX nerve agent - for those without calculators, 500 tons equals 1,000,000 pounds - plus around 30,000 munitions to deliver these agents, mobile biological weapons labs and uranium from Niger for use in a robust nook-yuh-lerr weapons program. Take your drink. Take your shot. Don't forget your kick to the head: Each and every single one of those comprehensively-debunked claims can still be found on the White House web site. Five American soldiers died in Iraq during the afternoon preceding Bush's SOTU speech on Monday. They were patrolling the city of Mosul and were struck by a roadside bomb that was followed up with lethal gunfire. There have now been 36 American soldiers killed in Iraq during the month of January, and 3,940 killed in total since Bush gave that January 2003 SOTU address and thus signed the death warrants for our fallen troops. We don't do body counts, so there's no accurate way to assess how many tens or hundreds of thousands of Iraqis have been killed and maimed since that 2003 speech. Last Wednesday, 60 Iraqis were killed and 280 others were wounded when a huge bomb exploded in Mosul. The casualties, according to a New York Times report, were "mostly children, women and the elderly." "Americans are still dying at the rate of one every day," wrote Chicago Tribune columnist Steve Chapman last week. "And violent civilian Iraqi deaths, according to the independent web site Iraq Body Count (iraqbodycount.org), have averaged about 1,000 a month since September. That's far lower than last January, but it's no better than in 2005, and it's well above the levels of 2004 - when Iraq was already in the grip of bloody chaos. To pronounce that reduction a success is like driving your car into a lake and then bragging when you pull it halfway out." Bush managed all this with just the one 2003 SOTU speech. He's given seven of the things now, so adjust the body-count mathematics accordingly. Seven speeches. Seven years. Monday night's speech was almost breathtaking in its lack of substance. He promised to bring the 9/11 perpetrators to justice, again. He promised to bring democracy to the Middle East, again. He talked up tax cuts for the financially solvent, again. He threatened Iran, again. He massaged the debacle known as "No Child Left Behind," again. He mispronounced "nuclear" at least three times, again. 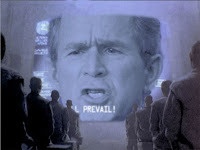 Basically, Bush could have just as easily been replaced by one of those high-school-chemistry-class projection screens showing some random video snippets from his other six SOTU addresses. Nobody would have noticed the difference. There was no there, there. Again. We have to put up with this man and his people for less than a year, or so most people believe. A story on today's Washington Post front page by Michael Abramowitz, however, reeled off a laundry list of pre-speech challenges for Bush that was capped by this line: "That is the problem Bush faces as he prepares to deliver his seventh and probably final State of the Union address tonight."